Los Cabos, a unique mixture of beaches, mountainous zones, and desert landscape is situated at the south end of the Baja California Peninsula and was named in 2017 as one of National Geographic’s must-see places to visit. A paradise between two seas, it is surrounded by the Pacific Ocean and the magnificent Sea of Cortes and is a sight to behold. 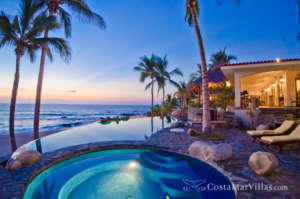 Regardless of the vacation, you wish to have, Los Cabos has something for everyone to enjoy. Dive in the depths of Cabo Pulmo, swim in the dazzling sea of Cortez, tour the beautiful Port of La Paz, or visit Loreto, a paradise full of history. This great desert and beach destination with its laid-back lifestyle and stress-free events will quickly captivate you, whether you simply want to relax for a weekend or have a longer vacation. 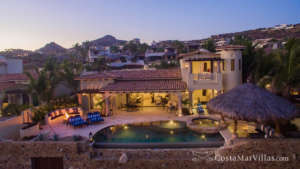 Luxury beachfront villa rentals offer stunning casitas in Cabo San Lucas, one of the world’s hottest travel destinations. 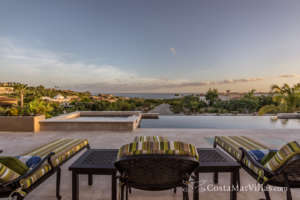 Casita 374 features sophisticated décor with elegant architecture that dazzles the eye and blends in perfectly with the fabulous outdoor living area of this magnificent casita. As gorgeous as it is during daytime with glorious views over the ocean, it really comes alive when the sun sets over the horizon, casting shadows over the stunning infinity pool and the fire pit is lit at night for a romantic atmosphere. Dinner can be served in the graceful outdoor dining area, just steps away from the pool. After dinner guests can retire to the brightly decorated indoor living area where the marvelous views can still admire through the open glass doors. After an adventurous day out a late evening dip in the hot tub or the jetted tub in the master suite will soothe and relax tired muscles before bedtime. Refreshed by an outstanding night’s sleep in luxurious bedding, guests can take in the breathtaking early morning views while drinking their coffee in the shade of the traditional palapa.